Billio comes with DT Recruitment plugin. This plugin is used to handle simple recruitment/vacancy information on website. 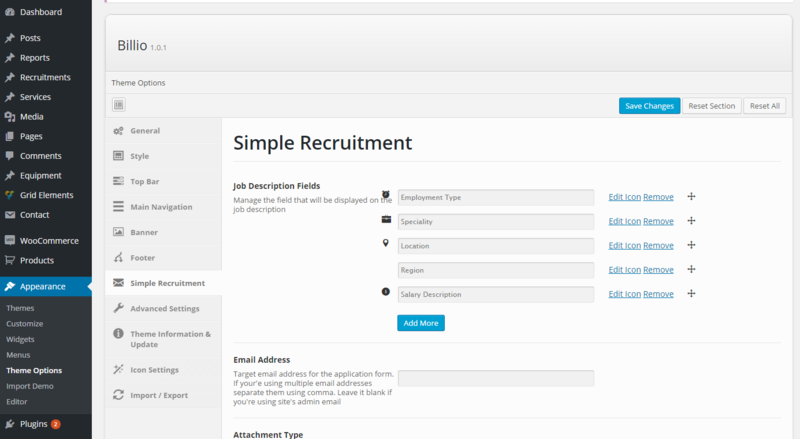 After DT Recruitment plugin installed, you will have additional tab named Simple Recruitment on Theme Options. Please visit Appearance > Theme Options > Simple Recruitment on WordPress Dashboard. Step 1 – Set Job Description Fields. 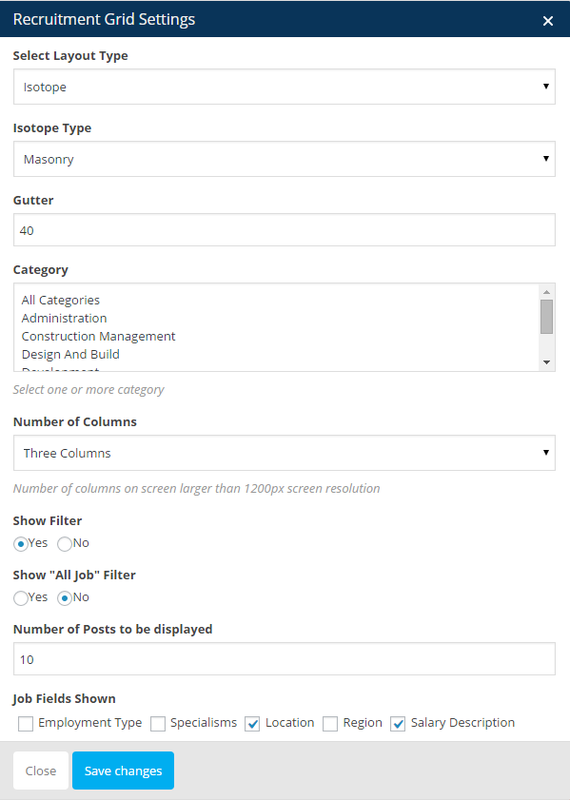 These custom fields will appear on Recruitment Custom Post. Step 2 – Set Email Address. This email address will be used as target email when visitors submit their application forms. If you using multiple email addresses separate them with comma. Leave it email address blank if you want to use site’s admin email as target email. Step 3 – Check Attachment Type. Select the file type allowed to attach in the application form. Step 4 – Set Attachment Size. Set the maximum attachment file size allowed to attach in the application form in KiloByte. Step 5 – Set Application Form Heading Text. This heading text will appear on application Form. Step 6 – Set Email to Friend Form Heading Text. This heading text will appear “Email to Friend” Form. Step 7 – Set Confirmation Message. This Message will appear when the application has been successfully sent. Step 1 – Navigate to Recruitment > Add New menu. 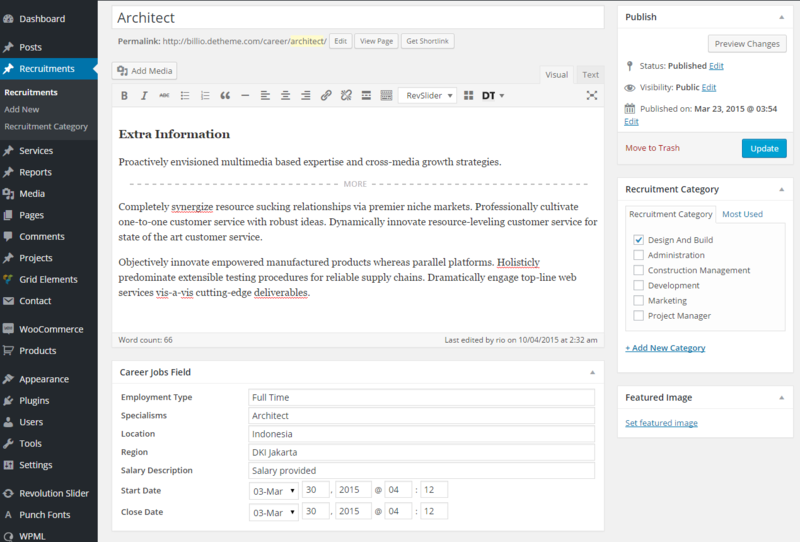 Step 2 – Enter the title, description, career job fields and choose or create recruitment category. Display Recruitment Posts on Page. Step 2 – Add Recruitment Grid Visual Composer Element to a row. Step 3 – Set Recruitment Grid settings. Step 4 – Click Save changes to finish.